Systems Managers Forum Comments from Systems Survey November 2004 Compiled by Liz Barton. 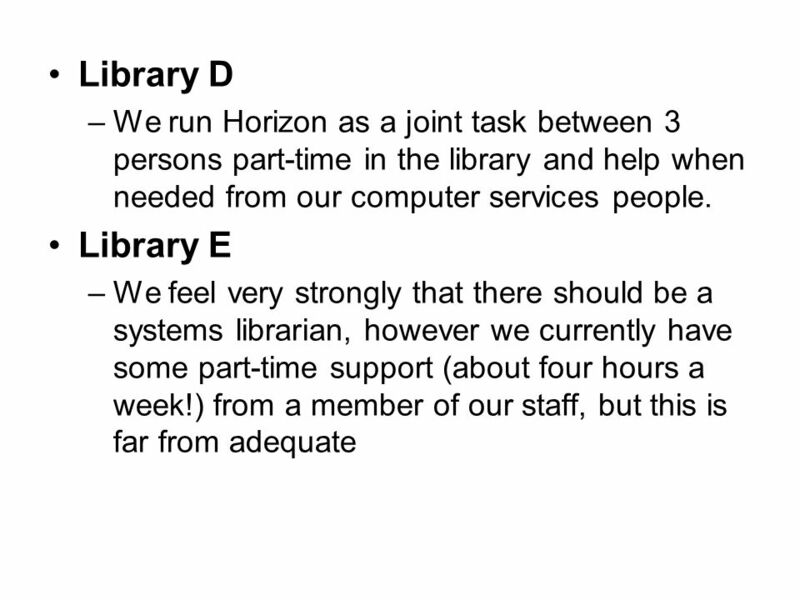 2 Library B –For an institution of the size of Library B, it works having one P/T person running Horizon IF it is simply a case of keeping the system ticking over. 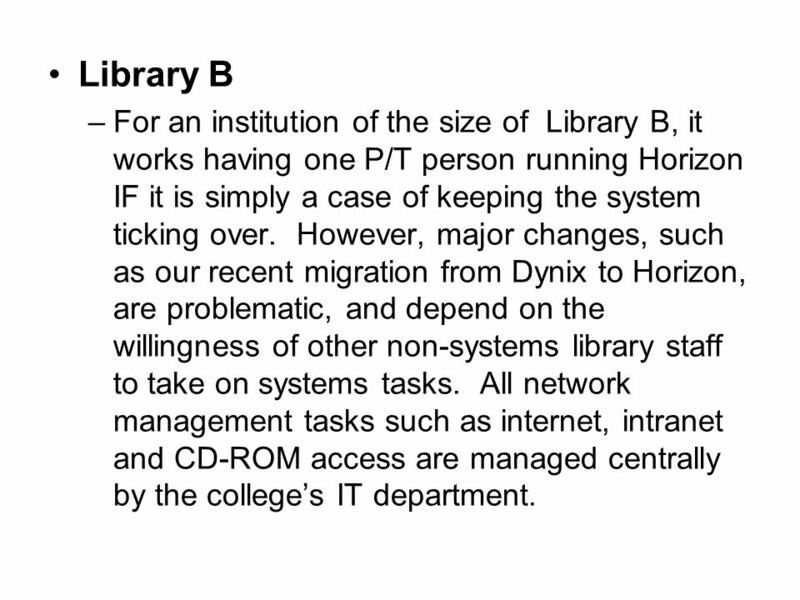 However, major changes, such as our recent migration from Dynix to Horizon, are problematic, and depend on the willingness of other non-systems library staff to take on systems tasks. All network management tasks such as internet, intranet and CD-ROM access are managed centrally by the colleges IT department. 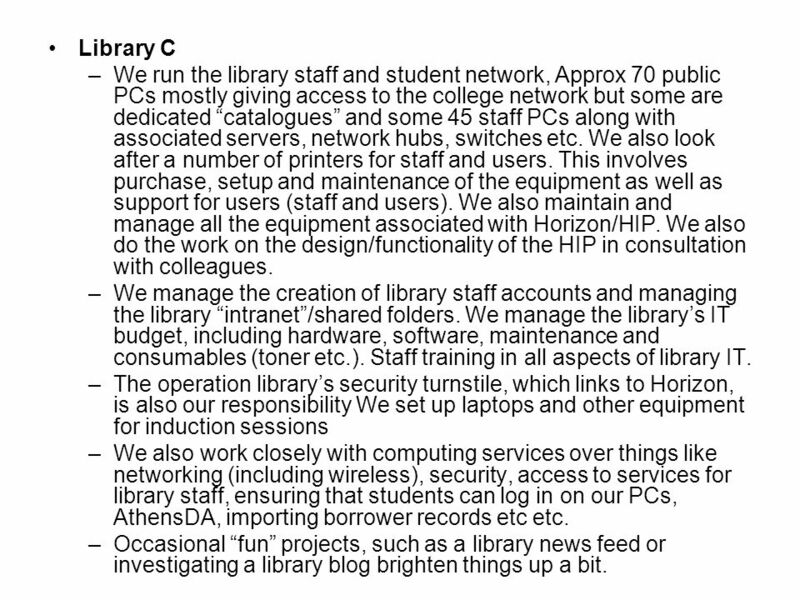 3 Library C –We run the library staff and student network, Approx 70 public PCs mostly giving access to the college network but some are dedicated catalogues and some 45 staff PCs along with associated servers, network hubs, switches etc. We also look after a number of printers for staff and users. This involves purchase, setup and maintenance of the equipment as well as support for users (staff and users). We also maintain and manage all the equipment associated with Horizon/HIP. We also do the work on the design/functionality of the HIP in consultation with colleagues. –We manage the creation of library staff accounts and managing the library intranet/shared folders. We manage the librarys IT budget, including hardware, software, maintenance and consumables (toner etc.). Staff training in all aspects of library IT. –The operation librarys security turnstile, which links to Horizon, is also our responsibility We set up laptops and other equipment for induction sessions –We also work closely with computing services over things like networking (including wireless), security, access to services for library staff, ensuring that students can log in on our PCs, AthensDA, importing borrower records etc etc. –Occasional fun projects, such as a library news feed or investigating a library blog brighten things up a bit. 5 Library F –I am systems librarian and also deputy college librarian and subject librarian for computing/business schools. –The systems role is information systems in the wider sense of electronic learning resources as well as the Horizon LMS. 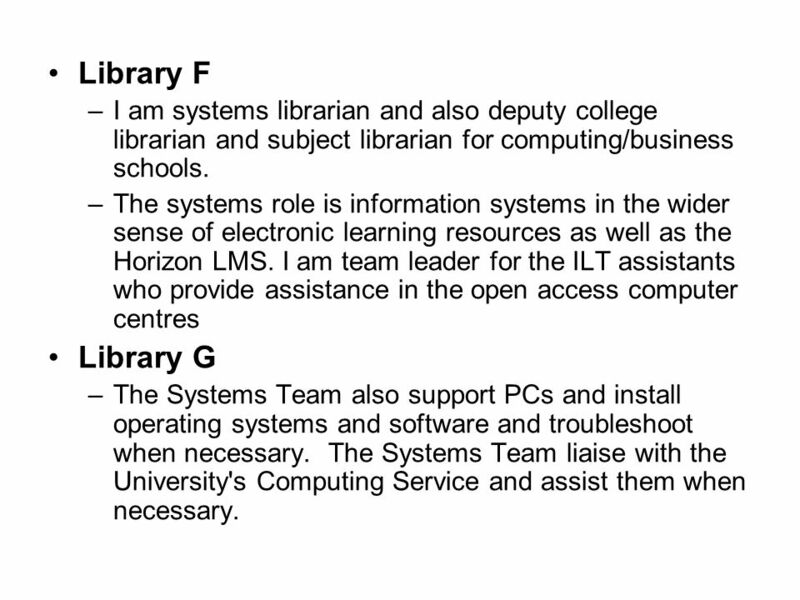 I am team leader for the ILT assistants who provide assistance in the open access computer centres Library G –The Systems Team also support PCs and install operating systems and software and troubleshoot when necessary. The Systems Team liaise with the University's Computing Service and assist them when necessary. 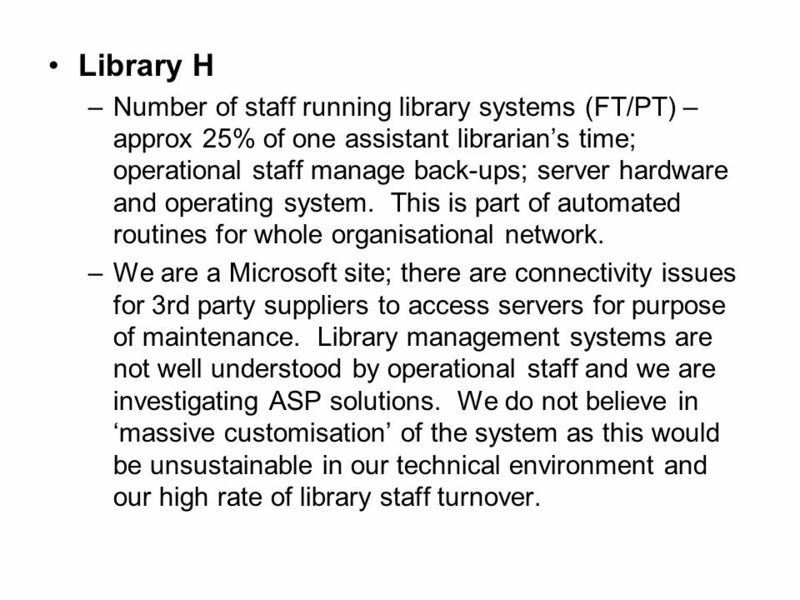 6 Library H –Number of staff running library systems (FT/PT) – approx 25% of one assistant librarians time; operational staff manage back-ups; server hardware and operating system. This is part of automated routines for whole organisational network. –We are a Microsoft site; there are connectivity issues for 3rd party suppliers to access servers for purpose of maintenance. Library management systems are not well understood by operational staff and we are investigating ASP solutions. We do not believe in massive customisation of the system as this would be unsustainable in our technical environment and our high rate of library staff turnover. 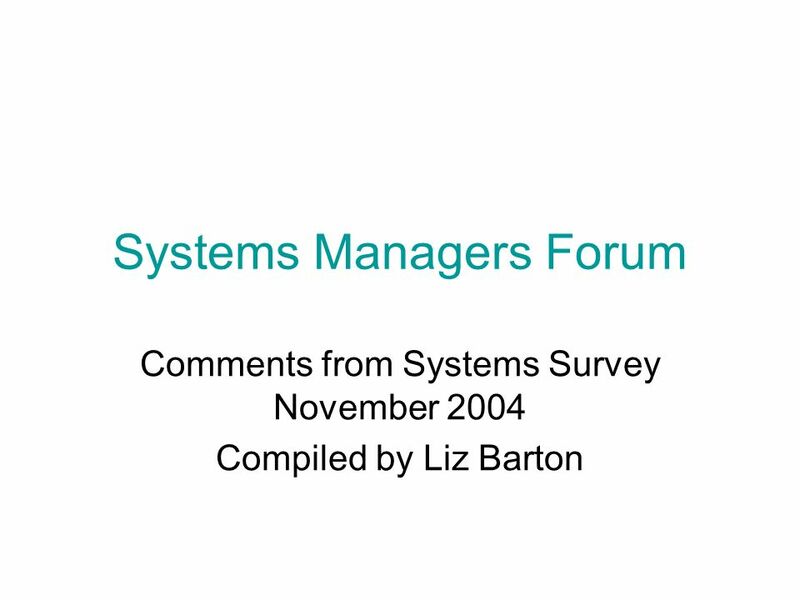 Download ppt "Systems Managers Forum Comments from Systems Survey November 2004 Compiled by Liz Barton." Capacity Building for Repositories Dr. Helena Asamoah-Hassan University Librarian, KNUST, Kumasi, Ghana at BioMed Open Access Africa Conference held at. Meeting and Event Administration Advice and Guidance for Practitioners. Introduction to Physics IT Support. To learn about IT Support available with the Department of Physics, and across the University. To find out a little. Dynix/Horizon: Vision and Future Product Development. Frank Wood and Alan Sangster, Frank Wood’s Business Accounting 1, 12 th Edition, © Pearson Education Limited 2012 Slide 22.1 Chapter 22 Computers and accounting. Information and Technology Services Customer Services. IT Technical Support Policies and Procedures South Nottingham College. Distributed IT Support Staff in Oxford Tony Brett IT Support Staff Services Oxford University Computing Services. Electronic Communications Electronic Communication Policy at Loughborough College Clare Holden Learning Resources Manager Loughborough College. Maria Campos Nancy Guzman Chang Lee Hyung Park Anshul Singh Elizabeth Vu Riley Wofford. © Copyright 2003, Binomial International Inc. Phoenix Business Continuity and Disaster Recovery Planning Software Recovery Planning Software Tools Recovery. AgVantage IT Services Systems Management Team Partnered with You and IBM® Agenda Disaster Recovery Service Disaster Recovery Service IT Visors IT Visors. Chapter 13 Organizing Information System Resources MIS Department Centralization and Decentralization Outsourcing Computer Facilities and Services.